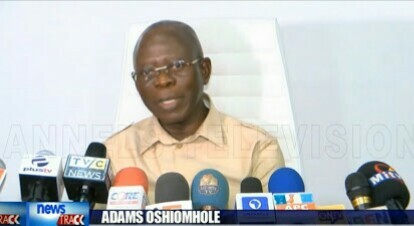 The social media is buzzing with a controversial slip by APC national chairman Adams Oshiomole while addressing journalists about how his party won the "highly rigged" Osun Rerun election. "For democracy to flourish, only people who can accept the pain of rigging (sorry defeat) should participate in an election". “Only people who can afford the pain of rigging should partake in elections” - Comrade Adams Oshiomole, National Chairman of APC, Channels TV, 28th September 2018.